Grandma Fifi: Independent Costco and Aldi Blog: No Pink Salt in Nashville? Recently both Costcotuu and Addicted to Costco blogs have had posts about Costco spices, and, in both those blogs, they mentioned Himalayan Pink Salt. Having never heard of this before, I decided to check it out. My Costco (unless I missed it) does not have Himalayan Pink Salt. I saw a couple kinds of sea salt, which I use occasionally, and regular table salt. 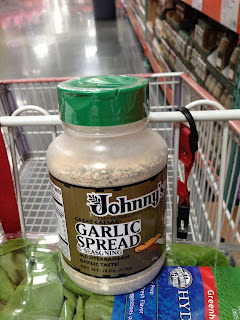 So, since I can't weigh in on the pink salt, I decided to write about my favorite Costco salt - the garlic salt, or Johnny's Great Caeser Garlic Spread and Seasoning. Even though salt is not the first ingredient (that's garlic), or the second (that's parmisan cheese), the product is quite salty, with 60 mg sodium in 1/4 teaspoon. I'm glad salt isn't bad for you any more. I remember right after Costco moved to Brentwood, Tennessee, (around 2000?) my friend Jerry Martin told me that this was the best stuff ever invented - good on meat, on vegetables and for garlic bread. I figured it was worth a try. I liked it, and I don't even like garlic bread. Most frequently, I use it to pre-salt salmon, beef, and chicken before grilling.